Kojo Senoo/Pipe Dream Photographer Buffalo Soldier sandwich. Exemplifying the saying, “Don’t judge a book by its cover,’” Old World Deli provides a welcoming atmosphere with an array of toasty and tasty sandwiches to choose from this Restaurant Week. Located at 27 Court St. in Downtown Binghamton, this deli is perfect for a quick bite to eat or a casual place to hang out with friends. For Restaurant Week, Old World Deli is offering a lunch special where customers can choose a sandwich, side and dessert option for a total of $12. To start, I ordered the redskin potato salad and despite not being the biggest fan of potato salad, macaroni salad and things of that family, I was instantly a fan of the sour cream-based spud dish. Other options for sides included German potato salad, which has more of a sweet taste, macaroni salad and Greek pasta. For my entree, I chose the Buffalo Soldier, one of four sandwiches on the menu. The sandwich tastes exactly how it sounds. 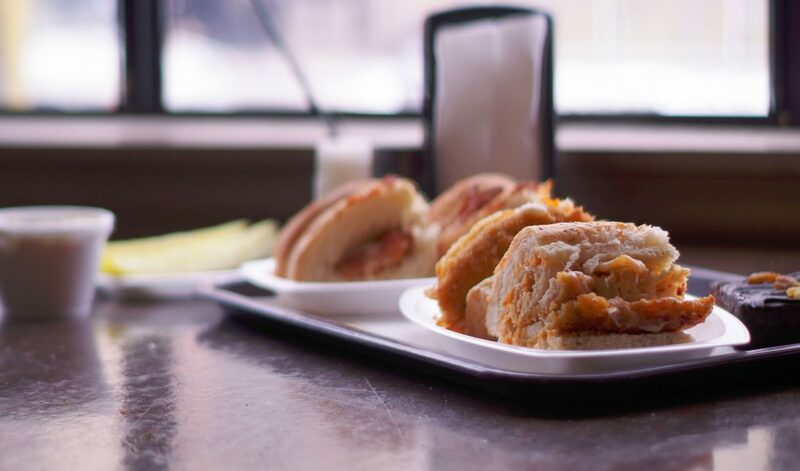 Strong like a soldier, the Buffalo sauce gives the sandwich a necessary kick. The sandwich consists of a Buffalo chicken cutlet and Buffalo turkey deli meat draped with provolone. Despite the amount of Buffalo flavor, the spice level is limited and very manageable if you’re not a fan of hot dishes. The spice was also nicely balanced with the flakiness of the bread. You can choose to have your sandwich on various types of bread including plain, cheese and oregano. Feeling a little crazy, I chose the oregano bread that complemented the Buffalo sauce of the sandwich well, but plain probably would have been the better option. Overall, the flakiness of the bread matched with the Buffalo flavoring and chicken and turkey made for a warm, delicious lunch. Other sandwich options include the Chuckster, one of the deli’s signature sandwiches that consists of bacon, turkey and chicken topped with mayo, barbecue sauce, lettuce and tomato. For dessert, there were three options including a fudge brownie, chocolate chip cookie and a fruit turnover. After trying the fudge brownie and the rather large chocolate chip cookie, I was extremely content. The fudge brownie had a unique, rich frosting topped with walnuts that was perfectly sweet. While I was pleased with my meal, I do wish there had been more varied entree options, including a vegetarian one. Still, I was pleasantly surprised by the quality of this deli. In addition to a delicious meal, the staff was very friendly and welcoming, as well as patient when my indecisive tendencies kicked in. The atmosphere was casual and customers came and went with ease. Its fast service, pleasant atmosphere and quality sandwiches make Old World Deli the hidden gem of Court Street, perfect for a midday meal in my mediocre life.